The West End’s new "Great British Musical" (The Times) has opened to huge critical acclaim. 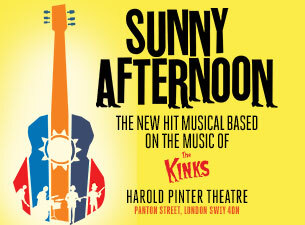 With Music and Lyrics by Ray Davies, a new Book by Joe Penhall and Direction by Edward Hall, Sunny Afternoon depicts the rise to stardom of The Kinks. Set against the back-drop of a Britain caught mid-swing between the conservative 50s and riotous 60s, this production explores the euphoric highs and agonising lows of one of Britain’s most iconic bands and the irresistible music that influenced generations. This “exhilarating, hugely enjoyable new musical” (Financial Times) features many of the band’s hits, including: You Really Got Me, Waterloo Sunset, Dedicated Follower of Fashion, All Day and All of the Night, Lola, Sunny Afternoon and many more.